Whitnash progressed to the second round of the Telegraph Challenge Cup but there was penalty heartache for Stockton. Whitnash opened up a two-goal lead inside 20 minutes in their tie at Coventry Colliery courtesy of a strike from Josh Cole and James Footman’s third goal in as many games. Town wasted numerous chances to put the game to bed and a defensive mistake gave the Coventry side a glimmer of hope that they could take the tie to penalties. However, Whitnash held on to progress. 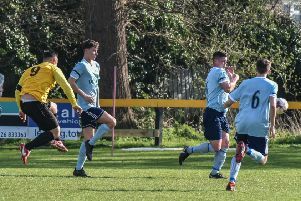 Meanwhile, Stockton boss Scott Easterlow is chasing a new striker after his side’s lack of cutting edge again came back to haunt them against FC Stratford. A one-sided second half saw Stockton waste a number of clearcut chances to break the deadlock, with Lee Golding and Joe Carter the most guilty. And, when the tie went straight to penalties at the close of the 90 minutes, Stratford held their nerve to win 4-3. “It says something when the opposition manager says to me ‘how you haven’t won that I will never know’,” said Easterlow. “It hits home we wasted a good opportunity to go through to the next round. “But it’s not as big a surprise as you may think. “We are so wasteful of chances even in games we have won this season and we have paid the ultimate price. “We’re are trying to add a goalscorer to the squad as soon as possible. Whitnash are without a game tomorrow while Stockton entertain Potters Green FC (2.15pm).